This collection of photos show a sampling of guitars I have owned or have available for sale. Call for more details of any of these guitars. 1-888-ROTHMAN Toll free. To the right is a 1912 Stahl Octave Mandolin, Natural, in Very Good condition. As pictured on pg 109 of the ''Larsons Creations'' book. 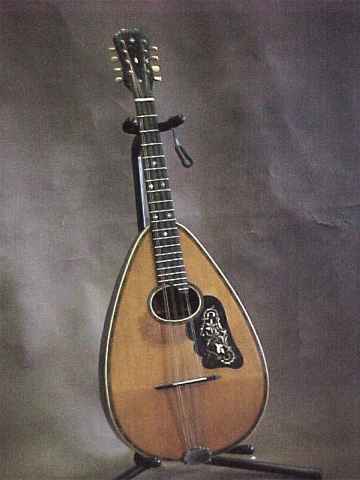 Larson made teardrop bodied instrument that fits between a mandola and a mandocello with a 21 3/8 scale lenght and tuned to ''F''. Bound amd marquetry trimmed natural finished spruce top with fancy tortise pickguard inlaid with elaborately engraved abalone leaves and vines. Dark stained maple sides and back. Ebony fingerboard inlaid with pearl 4 leaf clovers. 2 repaired cracks; 1 on top and 1 on back. Plays and sounds great. A rare find. Sorry this instrument has been sold. Browse through my different pages of guitars. There is an assortment of instruments from several different makers, including Harmony, Martin, Gibson, Stahl, and others.